Some archaeological sites are instantly striking and live long in the memory. An excavation near Andover in advance of new housing for Persimmon Homes certainly falls into this category. 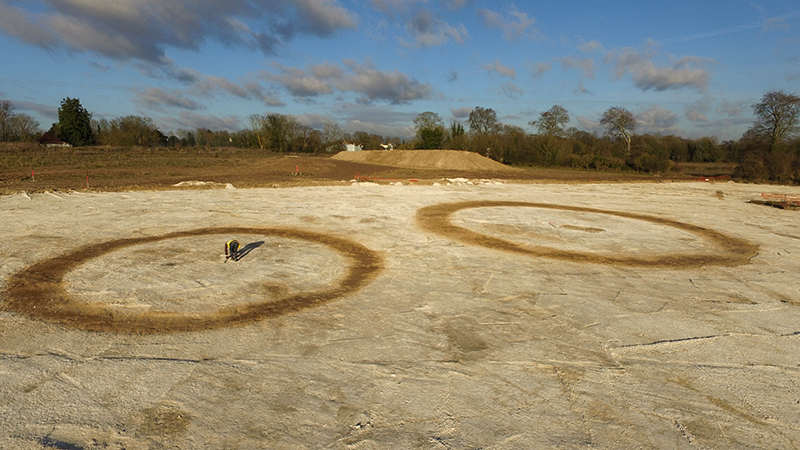 On stripping the topsoil, the surface of the underlying natural white chalk was exposed, and clearly visible in this were the contrasting dark backfills of the ring ditches defining a group of Bronze Age ritual monuments which dated to approximately 2200-1800 BC. 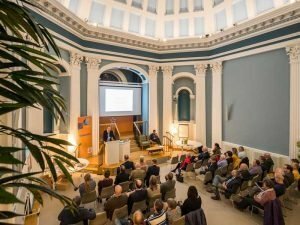 It is too easy to forget just how superstitious past populations were, but as archaeologists we are aware of the massive effort expended in the construction of monuments which outwardly appear to have been of little functional use in the day to day business of prehistoric farming societies. 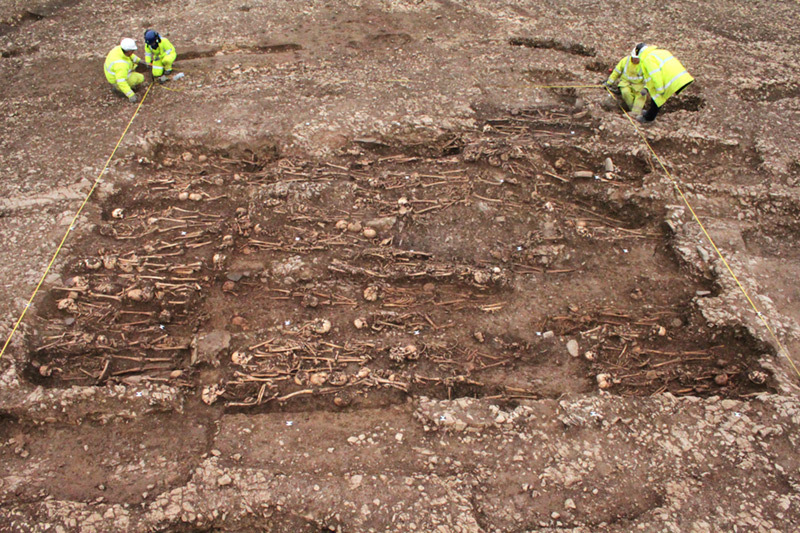 People obviously believed that the collective building of large circular barrows within which the remains of important people were buried was both necessary and worthwhile. These remains speak to us of the power and influence that some people exerted over others, and the need for small social groups to demonstrate their place in the landscape –this doesn’t seem to have been a very egalitarian society. This cemetery remained an important focus until the Roman period, when large quantities of pottery were deposited in barrow ditches. 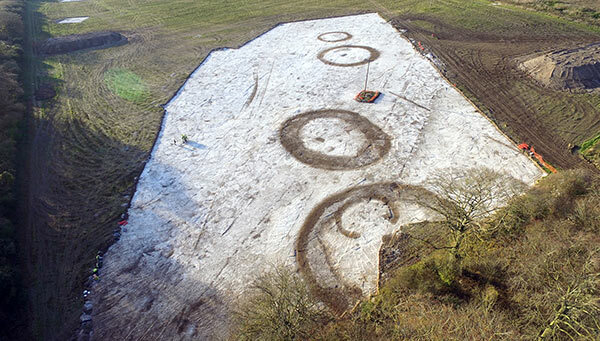 The work involved in constructing some of the barrows was considerable – in two cases, the ditches were 5m wide. The high mounds of freshly-excavated white chalk from the ditch, located on a prominent ridge, were designed to be visible in the landscape and provide a significant backdrop to the everyday lives of local communities. 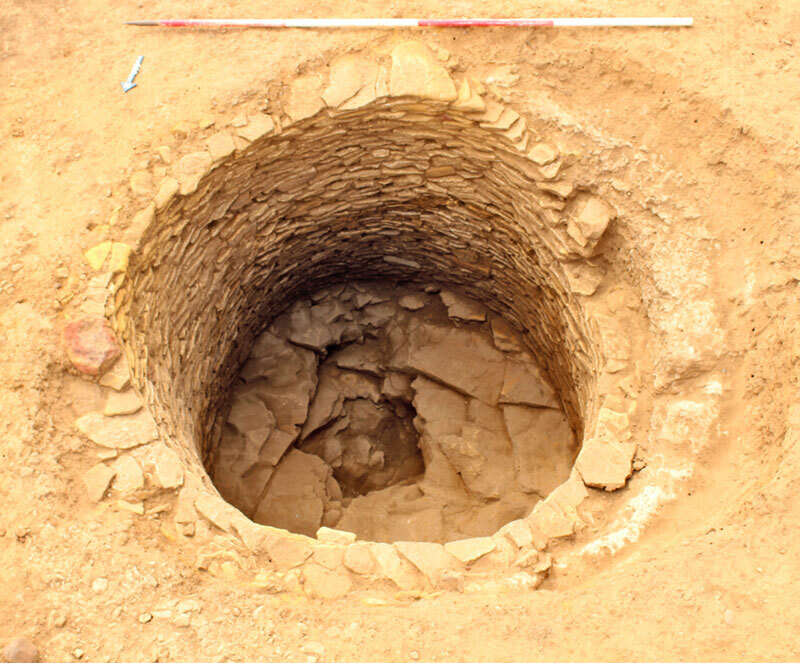 For me, however, the discovery that remains freshest in my mind was an incomplete circle of fifty stake-holes, arranged around a central cremation burial. These tiny features formed by pointed stakes being driven into the ground were wonderfully well- preserved in the surface of the chalk – they could almost have been made yesterday. Read more about this fascinating site here. In the last few decades those areas that have experienced the most new building have also seen the most archaeological exploration. Sometimes, however, we end up in places that have seen comparatively little previous investigation, and this provides us with a chance to write the first systematic archaeological story of an area. This was just the case at Hinkley Point in West Somerset, where EDF Energy is currently building a new nuclear reactor. This major development provided us with an opportunity to examine a large tract of land bordering the Bristol Channel. From the reactor site itself there are fine views out across the water to the South Wales coast, but the area is exposed and susceptible to strong wind – we regularly saw the rain clouds being blown apace towards us. 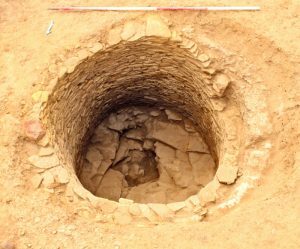 So you might have thought that this was an unlikely spot to find much archaeology, yet quite the opposite proved to be true. 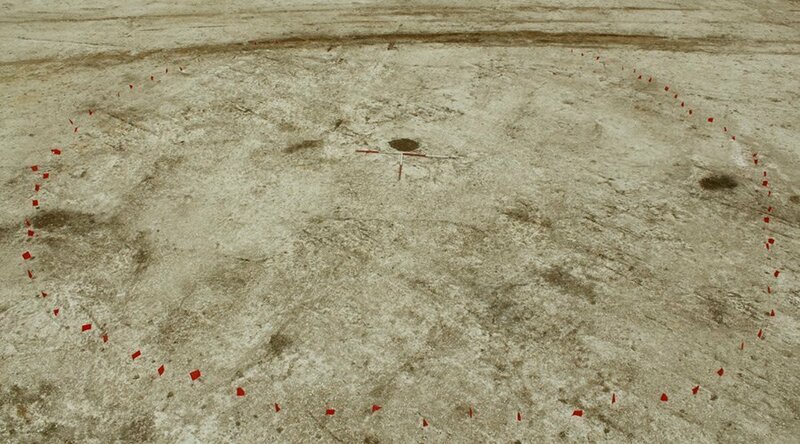 Our work revealed fascinating evidence for past activity in this remote spot stretching back until around 3000 BC. Virtually all periods of the past were represented, including Iron Age and Roman settlements and a fascinating post-Roman cemetery dating from the 5th to 7th centuries AD. 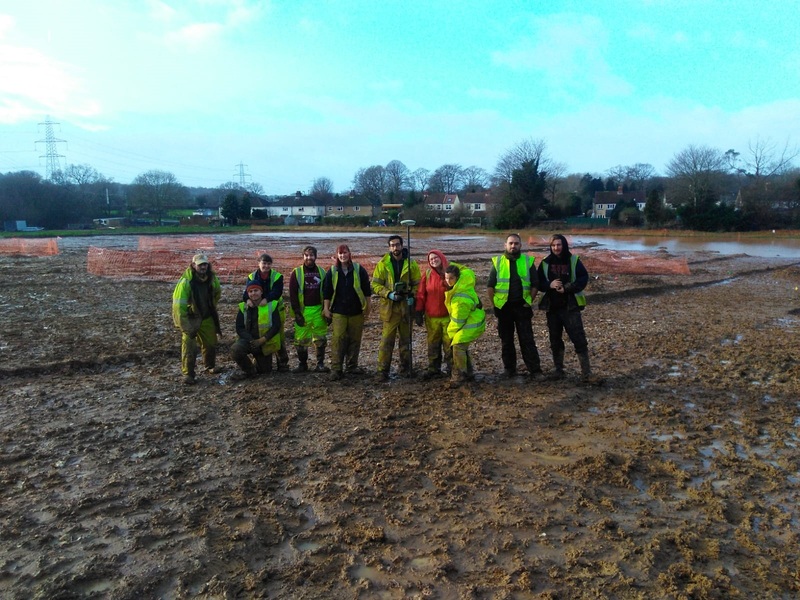 We also examined the site of a farm which was only abandoned in the 1960s, and amazingly showed that this site has also been occupied in the Iron Age, Roman and medieval periods. What was it about this spot that drew people back to it throughout history? 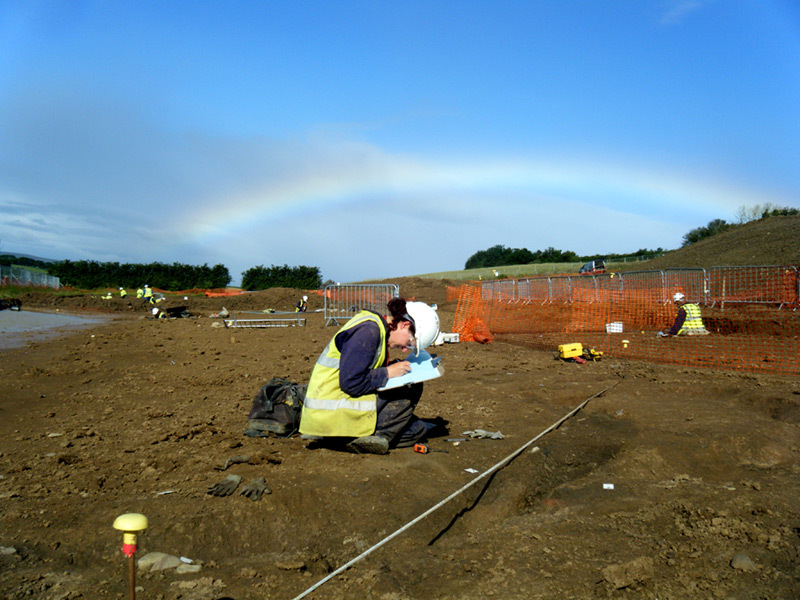 Fieldwork at Hinkley Point is now over, and we are engaged in the vital process of analysing and reporting on our findings. 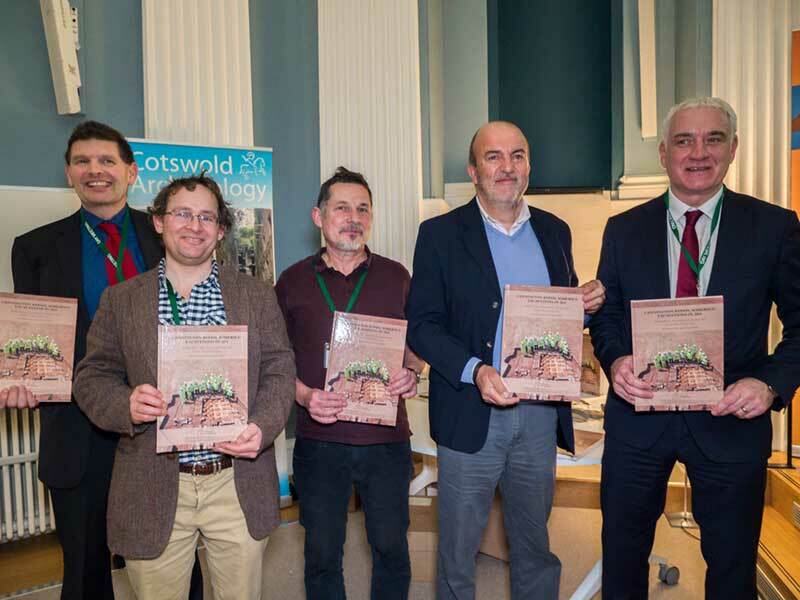 Our first book on an Iron Age settlement and Roman villa near the village of Cannington has just been published, and further volumes will follow over the next few years. Cotswold Archaeology has just published the first volume in a planned series about the archaeology of the Hinkley Point C construction project, undertaken on behalf of EDF Energy. 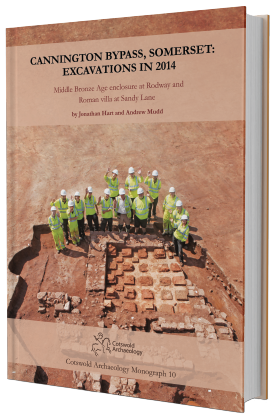 The book – Cannington Bypass, Somerset: Excavations in 2014. Middle Bronze Age enclosure at Rodway and Roman villa at Sandy Lane – concerns the results of excavations ahead of the infrastructure work around Cannington village. 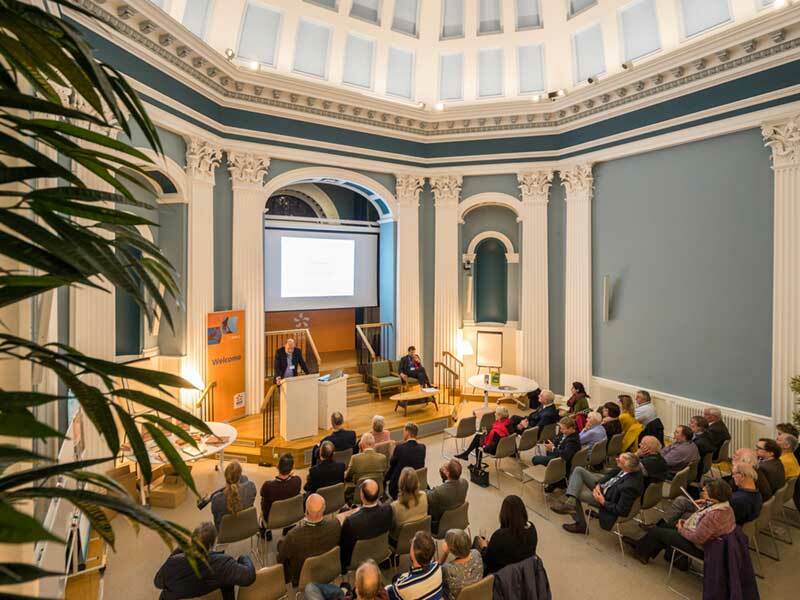 To mark this publication, South West Heritage Trust has arranged a book launch, that was held at Cannington Court in the evening of Wednesday 6th March. The book is being distributed by Oxbow Books, Oxford. Some photos from the event. We sometimes think of the Roman invasion of AD 43 as a great watershed, but in many ways a lot of the developments which we think of as Roman were actually a continuation of processes that begun in the Late Iron Age (from about 100 BC onwards). One of the trends we can detect in some (but not all) parts of Britain was a desire – or need – to grow more food and make more efficient use of the countryside. 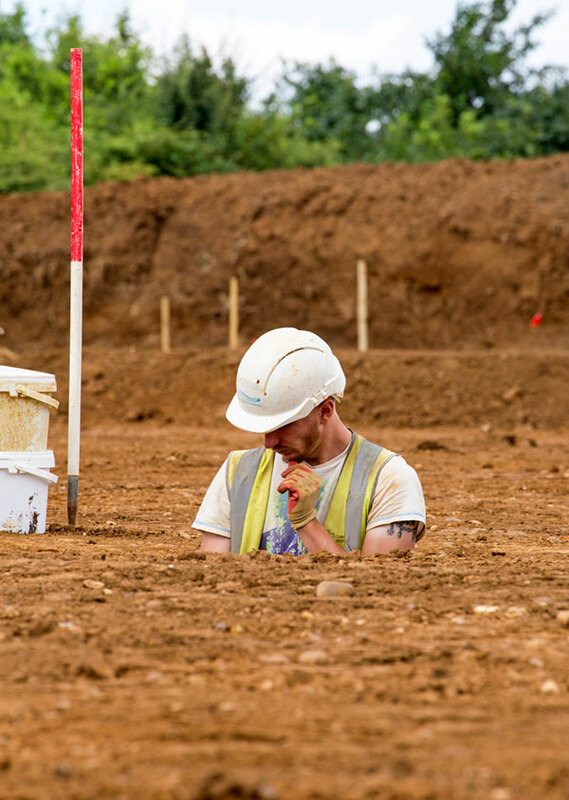 Our excavation in 2016 at Brixworth, Northamptonshire, for Barratt Homes provides a good example of this process in action. From around 400 BC onwards a series of trapezoidal and sub-circular enclosures were constructed, associated with a large number of pits which were likely used for the storage of grain and other agricultural products. A lovely beehive quern demonstrates that grain was being turned into flour on the site. 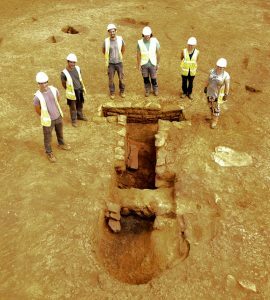 This activity continued seemingly unaffected by the Roman invasion and the site developed into a farm made up of a complex series of enclosures that were used either as places to live or for a variety of agricultural purposes, including crop processing. 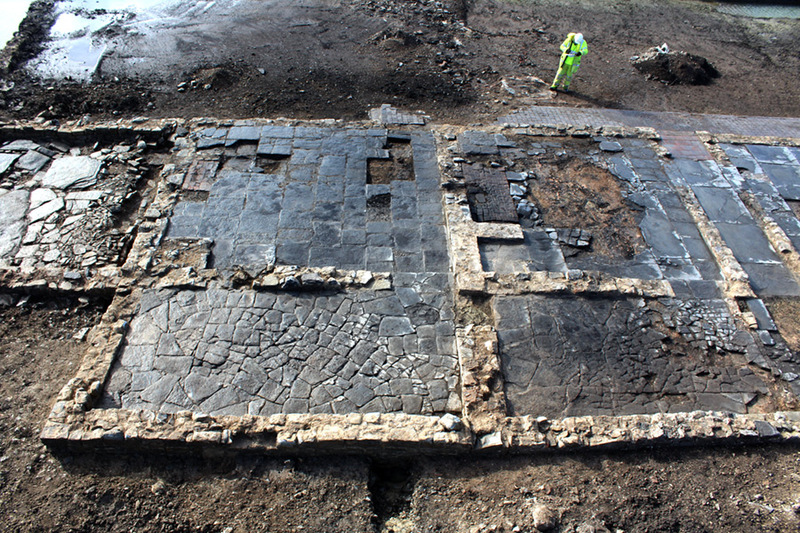 The construction of a large drying oven suggests an expansion of crop-processing activities in the later Roman period (roughly AD 200-400) and perhaps even brewing (the oven might have been used in the malting process). The people who lived in Brixworth must have devoted much of their waking hours to agriculture on an almost industrial scale. Let’s hope they enjoyed their local beer when the day’s toil was over. 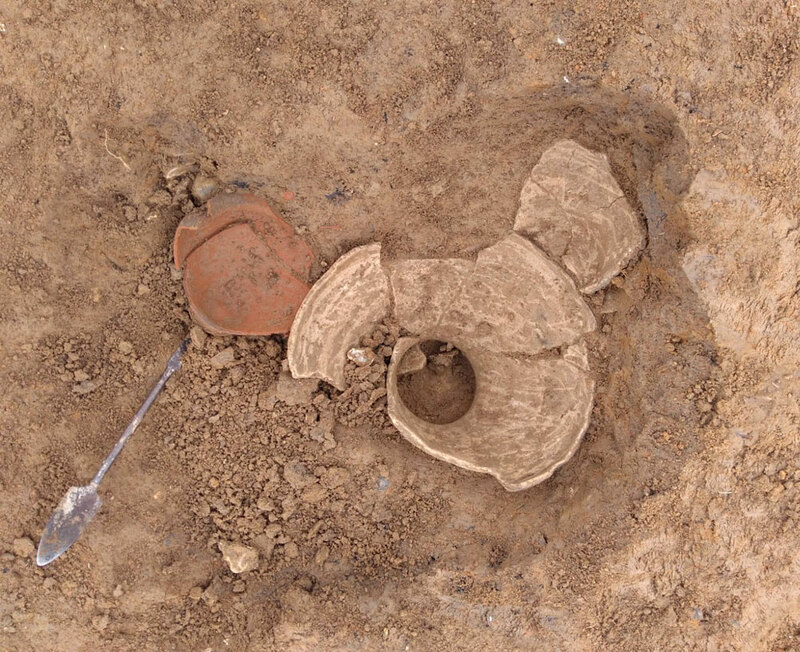 You can see some of the finds from Brixworth following the links below. New CA Reports Online website launched! 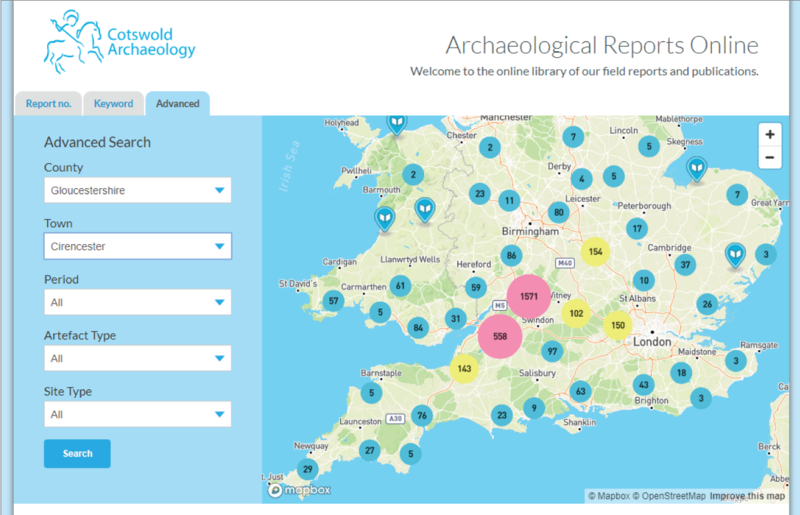 Many of you will already know of our ‘Reports Online’ website, the online library that makes freely available pretty much every CA fieldwork report that we’ve ever produced, with new reports added as they become publically available. Frequent visitors may also have noticed that the website hadn’t been performing too well recently – due to the increasingly large number of reports hosted it had become rather slow to load. It also had a search form that wasn’t very user friendly and it didn’t work well on mobiles devices, so in 2018 we decided it was time to revamp the website – and we are pleased to announce that the new ‘Reports Online’ website was launched just before Christmas!